Acknowledged author Joshua Dressler wrote Cases and Materials on Criminal Law, 7th - CasebookPlus (American Casebook Series) comprising 1139 pages back in 2015. Textbook and etextbook are published under ISBN 1634601653 and 9781634601658. 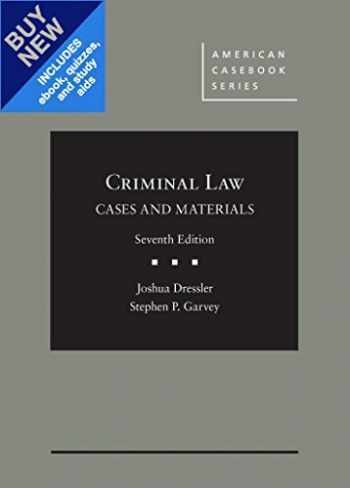 Since then Cases and Materials on Criminal Law, 7th - CasebookPlus (American Casebook Series) textbook received total rating of 4 stars and was available to sell back to BooksRun online for the top buyback price of $91.64 or rent at the marketplace. As a part of our CasebookPlus offering, you'll receive the print book along with lifetime digital access to the eBook. Additionally you'll receive the Learning Library which includes quizzes tied specifically to your book, and outline starter and digital access to leading study aids in that subject and the Gilbert Law Dictionary. This popular casebook, through the selection of classic and modern cases, provides an excellent tool for teaching students the common law foundations of the criminal law and modern statutory reform, including the Model Penal Code. Along the way, the casebook considers modern controversies (e.g., "shaming" punishment, capital punishment, broadening sexual assault law, self-defense by battered women, euthanasia, the role of culture in determining culpability), and creatively uses literature (e.g., examining insanity through Edgar Allen Poe's The-Tell Tale Heart) and even "brain teasers" to confront (as the Preface states) "the Big Questions . . . that philosophers, theologians, scientists, and poets, as well as lawyers, have grappled with for centuries." The Seventh Edition, as in the past, includes new cases, as well as updates in the notes that bring current issues of criminal law to the fore.